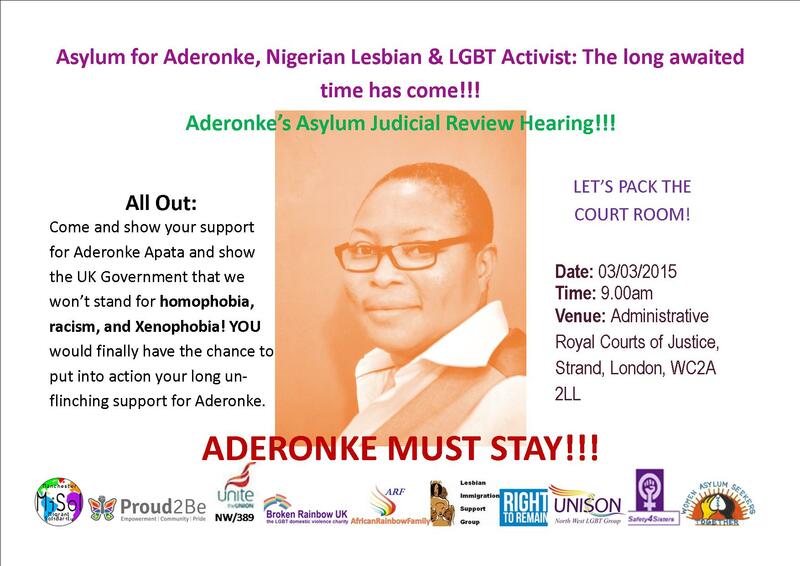 Asylum for Aderonke: Nigerian Lesbian & LGBT Activist’s Judicial Review Hearing!!! Aderonke, Nigerian Lesbian & LGBT Activist’s Judicial Review Hearing!!! I welcome you to a New Year, 2015. I would like to say thank you for being there for me throughout previous years! Your support over this period of my campaigning to remain safe in the UK has been enormous and unflinching. There is still an hurdle to cross and am confident you’ll hold my hand and cross it with me! On Tuesday 03/03/2015, the long awaited Judicial Review Hearing of my asylum claim to remain in the UK would be coming up at The Royal Courts of Justice, Strand, London. WC2A 2LL at 9.00am. I am therefore asking that you come with me and support me on that day as your presence is of utmost importance to me! Please let me know of your attendance to book tickets in advance!!! Attached are details for your information, please keep this day free in your diary. Share within your networks and publicise as much as you can. I would be in touch again closer to date. May we all move from illusion to truth, darkness to light, ignorance to wisdom and may we all find peace.